Lotto Social’s members have voted to donate more than half of March’s charity funds to Trigeminal Neuralgia Association UK. Launched in 2007, Lotto Social is a hugely popular online lottery service that brings together members into a lottery syndicate. The service aims to simplify the process of playing in syndicates, making the lottery experience socially engaging and allowing members to maximise chances of winning. As part of the service, every month Lotto Social donates £1,000 to charity. Members are given the opportunity, through an open panel, to select which charity they would like their donation to be directed to that specific month. The two most prominent charities are then pitched against each other and members vote for how the donation should be allocated. Each pledge shifts the percentage of how the £1,000 is to be split between the charities. Lotto Social has been donating for the last 15 months to charitable causes through JustGiving. JustGiving is the world's most trusted platform for online giving. Its mission is to ensure no great cause goes unfunded. Founded in 2001 and with over twenty-two million subscribers, to date the platform has helped people in 164 countries raise over $4.5 billion for good causes. In March, Europe’s first dedicated Trigeminal Neuralgia charity, Trigeminal Neuralgia Association UK received a 68% share of Lotto Social’s donation. Trigeminal Neuralgia (TN) is an extremely severe facial pain that tends to come and go unpredictably in sudden shock-like attacks. Frequency of attacks can vary from a few times a month to several times each day depending on the severity of the condition. Unfortunately, for most sufferers, the condition is progressive and will worsen over time. Although to date there is no guaranteed cure for the condition, there are a number of treatments which can give relief. The association’s aim is to raise awareness of the condition within the medical community and the public at large. Everyone wants to win the lottery. But the way to play hasn’t changed since forever. You buy a ticket; you wait for the draw. Where’s the fun in that? It’s time to shake things up a bit. We’re Lotto Social and we are here to make playing the lottery fun again. The more lines you have in a draw, the more chances you have, simple! But syndicates can be complicated and time consuming. Our mission is to make playing together fun. So, we give you all the benefits of playing in a syndicate without the hassle. We look after collecting the money, buying your tickets and distributing the winnings. All within a safe, legally assured framework. You can create your own syndicates with family and friends, or join an existing one, with nothing to worry about except how to spend that jackpot! The clue is in our name. At Lotto Social we are all about bringing people together. We create spaces for you to chat, join new communities, play games, help charities, win reward points and yes dream. The lottery is no longer a solitary game; it is a social one! We’re not new at this, Lotto Social has been shaking up the way we play popular lotteries like EuroMillions and Powerball since 2007. 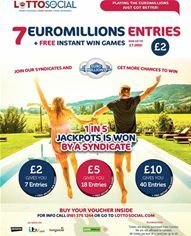 We have grown to become one of the UK’s favourite lottery syndicates, with 60,000 happy members.